Palestinian amora of the first generation (3d cent.). He is known chiefly as a transmitter of the sayings and traditions of the patriarch Judah I., whose disciple he was. These as well as his own sayings are further transmitted by R. Joshua b. Levi and by Ḥiyya ben Gamda. 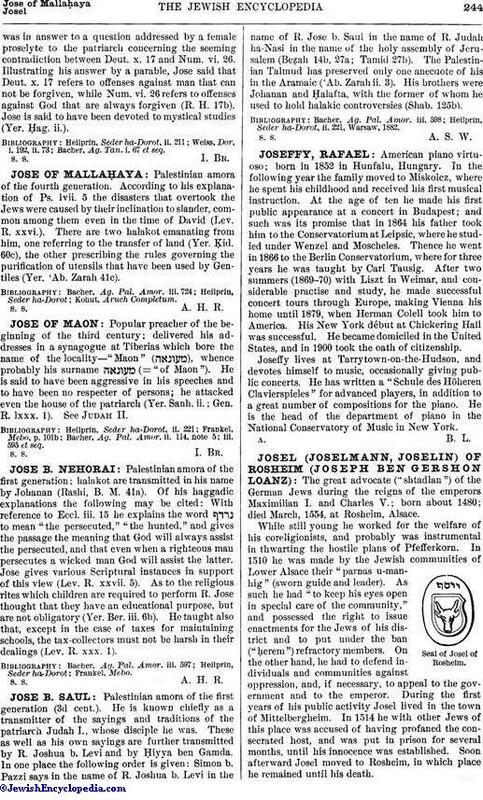 In one place the following order is given: Simon b. Pazzi says in the name of R. Joshua b. Levi in the name of R. Jose b. Saul in the name of R. Judah ha-Nasi in the name of the holy assembly of Jerusalem (Beẓah 14b, 27a; Tamid 27b). The Palestinian Talmud has preserved only one anecdote of his in the Aramaic ('Ab. Zarah ii. 3). His brothers were Johanan and Ḥalafta, with the former of whom he used to hold halakic controversies (Shab. 125b). Heilprin, Seder ha-Dorot, ii. 221, Warsaw, 1882.